Wayne Rooney's reckless dismissal did not stop Manchester United from returning to winning ways as they edged past West Ham on a nervy afternoon at Old Trafford. Rooney became the third-highest scorer in Premier League history when he opened the scoring for United with a deft volley and Robin van Persie doubled the lead with his 50th goal for the club. Rooney then put his team's chances in jeopardy by kicking out at Stewart Downing, but despite Diafra Sakho's header making it awkward, Louis van Gaal's side held on for a 2-1 win. Just like in last week's shock defeat to Leicester, United looked very impressive at times going forward. The attacking trio of Rooney, Van Persie and Radamel Falcao combined well up front, until the United captain was sent off in the 59th minute for the foul, which occurred deep inside his own half. At the back, United looked vulnerable once again, although in fairness to Van Gaal, his injury troubles were so bad that he had to give 19-year-old centre-back Paddy McNair a debut. Of more concern to Van Gaal will be Rooney's absence, which will last three matches if the dismissal is deemed to be violent conduct by the Football Association. That would rule the United skipper out of the forthcoming games against Everton, West Brom and Chelsea - three games United will want to win to put themselves firmly back in the hunt for the Champions League places. The desire to put last week's capitulation to bed was clear from the first whistle. United hit West Ham with attack after attack, and it took less than five minutes for the hosts to break the deadlock. Rafael sprinted down the right flank after dinking the ball over Aaron Cresswell. The Brazilian paused and crossed for Rooney, who volleyed past Adrian after one bounce. The expert execution of the volley across the West Ham goalkeeper was befitting of a striker whose Premier League scoring record is only bettered by Andy Cole and Alan Shearer. United's creaky defence almost cost them the lead within one minute of Rooney's goal. Daley Blind's miscued clearance landed straight into the stride of Enner Valencia, but he blasted into the Stretford End. It was a let-off for the hosts, who quickly sought to settle the nervy home crowd with a second goal. Rooney found Van Persie at the back post with a delightful cross, but the Dutchman headed wide. Angel di Maria shot high and wide from inside the West Ham box and Rooney then fluffed a shot inside the area. Van Persie had no such trouble in the 23rd minute when he put United 2-0 up. Adrian put Alex Song under pressure with a poor clearance and United took full advantage. Ander Herrera nicked the ball off the Barcelona loanee and Van Persie angled his shot past the West Ham goalkeeper after a clever pass from Falcao. For all their attacking brilliance, at the back United still looked suspect. Song slipped Sakho in behind, but Marcos Rojo raced across to put in a vital tackle. Sakho found the net a few minutes later though, due to a rare error from David de Gea. Song hit the bar with a header after the Spaniard flapped at a corner and the ball fell to Sakho, who headed into an empty net. Sakho put McNair under pressure as United desperately tried to hold on to their lead before the break. After the break, West Ham continued to press. Aside from a shot by Falcao, United offered little on the attack. Slack marking from debutant Luke Shaw allowed Sakho to sting De Gea's palms with a fierce volley. United looked shaky in the face of West Ham's attacking play, and their task was made much harder when Rooney was sent off just before the hour. 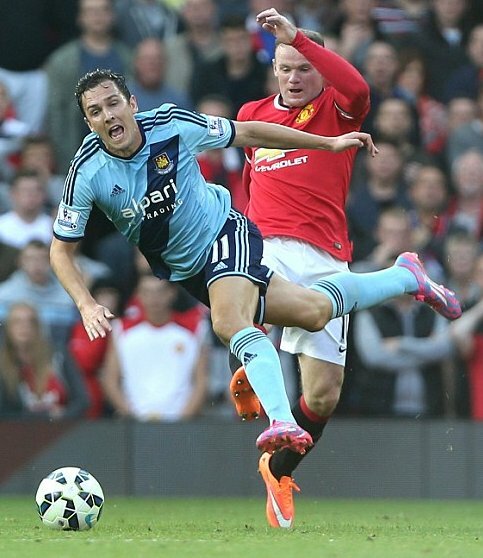 The United captain, unable to catch Downing, kicked the midfielder from behind while he was at full pace. Referee Lee Mason blew his whistle and then, to the shock of the home fans and players, showed Rooney his first red card for United in five-and-a-half years. Van Gaal looked to shore up his team by bringing Darren Fletcher on for Falcao. West Ham sent Carlton Cole on and looked to press home their numerical advantage. Sakho rippled the side-netting and Valencia's deflected shot flew inches wide as West Ham piled on pressure. Herrera hobbled off with a back injury before McNair made a goal-saving header deep inside the home box. Kevin Nolan turned in Carl Jenkinson's cross in the 89th minute, but linesman Andrew Garratt flagged for offside and United held on to record the second win of Van Gaal's tenure. There will come a time when Manchester United get rid of this unwanted knack of making life implausibly difficult for themselves but, plainly, that time is still some way off and for a long while here there was the very serious risk they might sieve away a two-goal lead for the second time in a week. This time, they held out but there were some hairy moments after Wayne Rooney�s sending off and it was a bittersweet occasion for the man Louis van Gaal had entrusted to be his captain. Rooney really ought to have grown out of the sort of moments that led to him being shown a straight red card on the hour for a wild kick from behind on Stewart Downing and he was fortunate that West Ham did not take advantage. Sam Allardyce�s team certainly had enough of the ball to be aggrieved by the final score and it was an onslaught during those moments late on when Kevin Nolan was denied an equaliser by a wafer-thin offside decision. Van Gaal�s men did at least show a spirit of togetherness during those final exchanges and there was a wonderful clearing header from Paddy McNair on a day when the 19-year-old rookie, signed from Ballyclare Colts four years ago, appeared in a patched-up defence. Yet it was still startling to see how vulnerable they were, even before Rooney�s dismissal, bearing in mind they had led 2-0 by the midway point of the first half. It was a desperate, nerve-shredding finale and Allardyce was engulfed in disappointment given the opposition�s defensive problems and the number of chances his team had accumulated, especially in that frantic last half an hour of almost unremitting pressure on David de Gea�s goal. Allardyce reserved most of his anger afterwards for the linesman, initially referring sarcastically to a �superman with X-ray vision� and a �super human being� before concluding that the official had �dropped a massive bollock�. Yet he was annoyed, too, about his team�s inability to make the most of their chances � �We fluffed them, we blew it� � and that really should have been the focus of his frustration. Allardyce had already been informed that Nolan�s head was marginally offside and that, really, is all that matters. What he could not explain was why his team had started so slowly when it might have been expected that they would quickly set about trying to get at the opposition�s new-look defence. Mark Noble�s absence through injury was a considerable setback but the home side had the longer list of absentees and West Ham were strangely subdued in an opening half an hour in which the home side attacked with speed and penetration. The first goal came in the fifth minute when Rafael da Silva went haring along the right touchline and picked out Rooney�s run into the penalty area. Rooney took his shot first-time, clipping a wonderfully taken volley into the far corner, and the early goal seemed to settle any of the nerves that might have carried over from last weekend�s ordeal at Leicester City. The second goal stemmed from Rooney and Ander Herrera pressurising Alex Song into losing possession inside his own half. Radamel Falcao played the pass into Van Persie and the Dutchman turned to make the shooting angle before delivering a precise right-footed finish just inside the post. In different times, a visiting side to Old Trafford would have judged this as the point to focus on damage-limitation and avoid an old-fashioned thrashing. Yet the modern-day United now encourage opponents to think there are other ways. West Ham also had a clear height advantage. After 37 minutes, Downing put in a corner and De Gea � possibly impeded, according to Van Gaal - could not get a clean punch on the ball. Enner Valencia had the first effort and when the ball came back off the crossbar Diafra Sakho was first to the rebound to score with another header. Van Gaal had used an old Dutch phrase - �het lek boven krijgen� - in his programme notes. That, he explained, meant �finding the leak and fixing it�. Yet the goal invigorated West Ham and they were the better side at the start of the second half. Perhaps it was a growing sense of alarm that unnerved Rooney as West Ham broke from the edge of their own penalty area and he found himself in a straight chase with Downing. The winger had a head start and Rooney no longer has the pace of old. Losing the sprint, it was a reckless way to stop his opponent; unnecessary, too, given the location of the ball, 70 yards from De Gea�s penalty area. �Too unfriendly,� was as far as Van Gaal would go. Yet his team held out when the consequences could have been much more grievous.